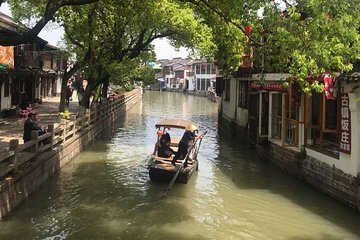 Experience ancient and new China in one day on this 9-hour Shanghai and Zhujiajiao water village tour from Shanghai. Travel to centuries-old Zhujiajiao, and tour its decorative bridges, pretty canals, and stone architecture by foot and hand-poled boat. Back in Shanghai, savor a classic lunch and tea-tasting, and visit highlights including the Confucius Temple and Shanghai Tower. Includes a flexible itinerary, minivan transport and and central pickup and drop-off at your chosen Shanghai location. Open to upgrade the tour to all inclusive package upon booking. Choose a central Shanghai pickup time and point, such as your hotel. Then, meet your guide, and enjoy the 1.5-hour drive to Zhujiajiao by private, air-conditioned minivan. On route, tell your guide if there’s something you want to see more of. As a private tour, the itinerary can be customized around you. Dating back 1,700 years, Zhujiajiao water village flourished during the Ming and Qing dynasties, and is fêted for its waterways, stone houses, and ornamental bridges. On arrival, take a guided walk through the narrow streets. View the traditional architecture, shops, and stalls — some specializing in Zhujiajiao’s famous rice wine — and admire must-sees like the 16th-century, five-arched Fangsheng Bridge. Return to Shanghai, and after a lunch of dishes like soup dumplings and noodles at a restaurant, tour some city highlights. Explore the Confucius Temple, seeing the carvings and halls dedicated to the ancient Chinese philosopher, and taste delicate Chinese teas at the Confucius Tea house. Continue to the Shanghai Poster Propaganda Art Center to see artworks from China’s Maoist era, and visit the Shanghai Tower, the world’s tallest at 2,703 feet (632 meters). Absorb the bird’s-eye views here before concluding with a drop-off at your chosen Shanghai city center location.